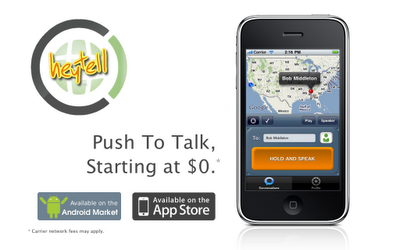 HeyTell is an application that allows voice messages to send instant by the method known as Push to Talk (used in communication via Walkie Talkie) which involves pressing a button to talk and announce the caller when finished to give the word. HeyTell works on phones with Android and in iPhone, iPhone and iPod Touch, is an alternative for these devices to the application Loud-talks BlackBerry. This applicationrequires WiFi, 3G, Edge or GPRS to converse with others online and no extra cost. HeyTell not intended to replace the so-called traditional voice and the conversation may not be smooth because it must wait until the message gets sent once and can exists a delay, but in case you want to contact someone on the outside can be a good choice or a free alternative to SMS (messages but with voice). Received messages can be saved for later listening. To add contacts to be sending invitations to use this application via email or SMS and once accepted and can chat with that contact. If you do not have the application open the contact will receive a notice when you send a message.